This past winter, I added a new addition to my apartment. To be specific, I made a small change to my living room. I added a traditional Japanese table called a kotatsu. A kotatsu is widely used in Japan and relatively rarely used outside of Japan, although there are examples of similar tables in Iran, Tajikistan, Afghanistan, Spain, China, and Korea. While they are used in other countries, I don’t know how widely used they are. In Japan, the kotatsu can be considered part of Japanese culture. No matter where you go, almost all families have a kotatsu. In the winter it is common to hear the majority of the population talk about having nabe while sitting at the kotatsu. Single people often don’t have one and people living a western lifestyle often stop using a kotatsu. For foreigners, unless you are living in Japan there is relatively little chance you will experience sitting under one, but if you stay in a ryokan or similar accommodation, you will likely get to experience a kotatsu. A kotatsu is a very simple device that is used to heat a small family in the winter. It is a wooden table with a heater built into it, sometimes under it, and a blanket over the table to trap the heat. Kotatsu can seat anywhere from 4 to 8 people depending on the size. Typically, a single kotatsu is built for about 4 people. The kotatsu originated in the 14th century when cooking was conducted in small sunken hearths. Someone had a great idea to place a blanket over the top, probably after the cooking was finished, to utilize the heat to keep warm in the winter. This continued to evolve and today we have the modern kotatsu that is all electric with the heater built into the table itself. Many modern kotatsu utilize a heat filament and a fan however the kotatsu that I purchased has a heat filament running throughout the underside of the table. It is an ingenious design that helps to save energy as only the kotatsu itself is used as a heat source. The blanket helps trap the heat but wearing a lot of clothing on your upper body is a must unless you want to get sick. Kotatsu are almost always located in the living room. It is a multi-purpose table that is used during dinner and evening entertainment. It is not uncommon to see families sitting under the kotatsu watching TV together. There is also the stereotypical bowl of Mandarin oranges sitting on top of the table. You can then imagine the parents having a beer while the children do some studying. 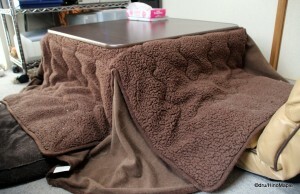 Depending on the size of the pet, the kotatsu is also used as a house for pets. Cats are notorious for sleeping in the kotatsu and they even call them “kotatsu-neko” or kotatsu cats. 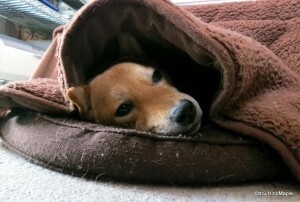 My little dog, well not so little, also loves to be in the kotatsu during the winter. When it is turned on during a cold day or evening, he will push his way to get inside the kotatsu and he will lie about as if it was summertime. I do get jealous that he can enjoy his little dog cave and I can’t enjoy it as much. While he does sleep there, he isn’t the only one to sleep there. Many people will also sleep at the kotatsu. Depending on who you ask, most Japanese people will tell you not to sleep at the kotatsu lest you catch a cold. While I personally don’t believe this, unless you are just wearing a t-shirt at the kotatsu, you are unlikely to catch a cold. My only problem with sleeping at the kotatsu is that it isn’t the most comfortable place to sleep. Often you sit on a simple cushion (zabuton) or a special seat designed for sitting on the floor (zaisu). Growing up sleeping on beds mean I am not capable of sleeping at the kotatsu but I know many people who will and have done it often. I am happy to have a kotatsu and I will definitely enjoy it. I found it to be most useful during the one snowfall in January 2013 where my room was colder than my fridge. I’m sure I’ll be able to enjoy more days and nights under the kotatsu in the future and I’m sure Sox will as well. 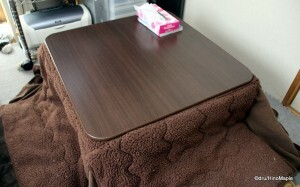 This entry was posted in Culture and tagged japan, Kotatsu, zabuton, zaisu by Dru. Bookmark the permalink. What a good invention, wonder why the rest of the world haven’t adopted it yet ha. Love your posts, interesting and also informative, keep it up! Yes, it is a great invention, but I think it is mainly for places where it does get cold inside. Back home, I rarely need it as it is nice and toasty inside the houses. But I know it’s not true. 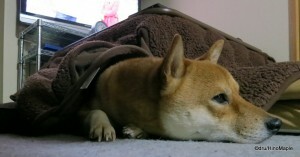 Dogs love kotatsu, don’t they? I don’t have a kotatsu in Tokyo, but it has saved my life more than once in Niigata’s winters.